Prairie and savanna with oak, pine, sassafras, and/or aspen; dry openings in beech-maple forests; sand barrens, often with Pteridium, dry open fields, and roadsides. The achenes tend to be a little longer than those of H. scabrum, as well as tapered toward the apex. 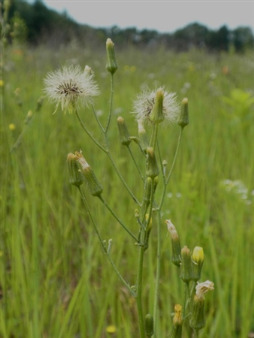 The hairs toward the base of the plant are sometimes soft and curled, but such plants, even if the leaves are all or mostly basal, can be distinguished from H. venosum by the abundance of stem pubescence, absence of reddish purple veins, larger achenes, and often elongate-cylindrical panicle of numerous heads. Hieracium longipilum has longer leaves, mostly 5–8 times as long as broad, sometimes densely crowded near the base, as well as longer hairs. MICHIGAN FLORA ONLINE. A. A. Reznicek, E. G. Voss, & B. S. Walters. February 2011. University of Michigan. Web. 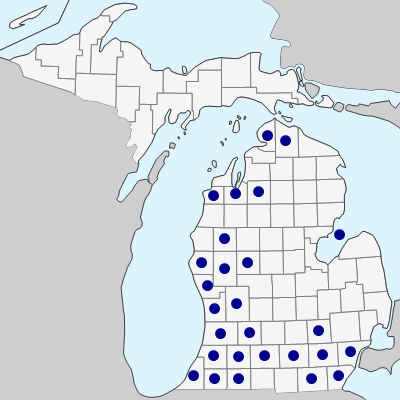 April 21, 2019. https://michiganflora.net/species.aspx?id=366.